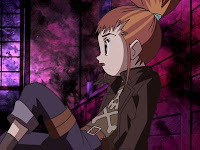 Digimon: System Restore: Tamers Episode 06: O Partner, Where Art Thou? In this episode, it would just be a typical Champion evolution debut if not for Rika and Renamon being so damn cool. As far as story structure goes, let's be honest... we've seen this one before. It's early in the show, you've got a Digimon and its partner still sort of feeling out their relationship. Neither is quite sure how this is supposed to be working, only that there's room for improvement. Along comes a nasty monster and things aren't going so well, but then the partners realize their strengthened bond and the Digimon evolves to Champion and wins the day! It's an apt description of this episode. It also covers pretty much the first seven episodes of Adventure. This one skates by not because it's an original story, but because of the uniqueness of the featured characters. 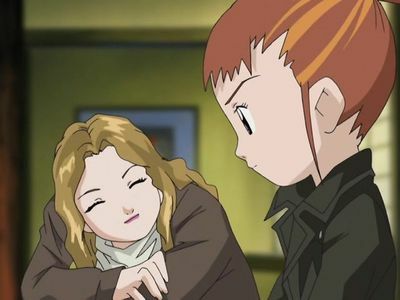 Rika is wired very differently from other characters and her initial approach to this tamer business is so skewed that this basic premise becomes a significant milestone in character development. The Rika picture is filled in quite nicely, through visuals and dialogue snippets rather than flashbacks that pound a message into your head. Everything leading up to the first battle with Allomon is a silent character note. She attends a swank private school. Her mother is young and outgoing, but works hard, often and at a job Rika cares little for. Despite the punk get-up, her household is traditional and she's at least moderately polite to her grandmother. Once she sees a digital field, however, forget all that because it's time to fight. After the battle, we get the darker side. The side that dominated a card game tournament so handily that she found it boring. The side that was targeted by several menacing Digimon begging for her to tame them. That scene in particular is really key. First off, the way the room darkens and seems to get absorbed halfway into the abyss has to be frightening. Rika is backed up against the wall with shadowy figures crawling after her, begging for her attention. Overwhelmed, she calls out for one strong Digimon. Now, some of these things are insanely powerful, including several Ultimates. Yet Renamon's the one that steps out. A Rookie. If Rika's true goal is to be the strongest tamer ever, she could have simply taken the SkullMeramon or whatever and crushed everything with it. Renamon's plenty strong, but her selection suggests that even as cold and raw as Rika was then, it was about more than just pwnage. She may have wanted a challenge. She may have wanted something to engage her. Hell, she may have just wanted a friend. Whatever the reason, the close call with Gargomon and this battle with Dokugumon has made Rika aware of the perils of Digimon taming. Renamon does her best to protect Rika, which is made out to be a bigger deal than it really is. All Digimon partners have done the same. What is different is that this alone did not trigger evolution the way it normally has. Instead, it required Rika to show sincere concern for Renamon. Not because she was afraid of losing, but because she was afraid of losing her partner. Oh, and also because Calumon showed up out of nowhere. There's that message reinforcement! Shame Calumon had nothing to do with this episode. The evolution to Kyuubimon is impressive, and is a slap in the face to Impmon, introduced in this episode trying to convince Renamon that partnerships with humans cause nothing but trouble and Digimon are better on their own. One episode and there's already a setback to his philosophy. It's a crack in Rika's armor as well as she realizes that she can't treat Digimon as soulless tools of recreation and expect to accomplish anything. Or at least she can't treat Renamon that way. It's a start. Rika's mother answers her phone “Makino,” using the surname from the Japanese version (it was changed to Nonaka in the dub). Why it was changed at all, I'm not sure but since it was... silly dub. If you're unhappy about the occult chalk marking censored in the dub last episode, you'll be pleased to know they dropped a tarot reference in this episode. Previously in the Japanese version, Juri mentioned tarot in a conversation, but that one was completely rewritten (not necessarily for the worse). Have Takato and Henry gotten so completely bored with having Digimon that they've resorted to playing rock-paper-scissors in Guilmon's pen? There has to be something more fun to do. Once again, the dub is cutting corners when translating modify sequences. This time, Agumon apparently knows an ice attack instead of SnowAgumon. Also, any stat booster seems to be called a Hyper Chip, even though they've done something different every time. During the flashback at the card game tournament, what the hell was the MC wearing? I'll buy that he's in cosplay... but of what exactly? In the Dokugumon battle, Renamon frees Rika from the web using a Diamond Storm attack. Shouldn't that have at least scratched Rika a little bit? For the MC... Looks like a Roman Legionary to me. Renamon can probably control the trajectory of Diamond Storm...or something. Anyone else notice Mummymon in there begging for Rika's attention. Of all the recurring characters, I wasn't expecting him.